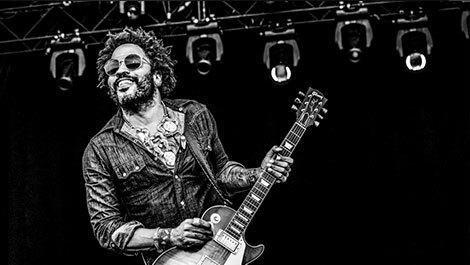 Torrance, CA - June 2016... Alex Alvarez is best known as Lenny Kravitz' guitar tech but after 25 years, he is in many ways Kravitz' right-hand man. For tours, he's the crew chief, responsible for hiring the crew, maintaining the equipment, and much more. Off tour, he manages Kravitz' studios in Paris and the Bahamas. Wherever Kravitz and his band go, you'll find a Mackie mixer in use. Alvarez also anticipates the release of Mackie's AXIS™ Digital Mixing System, a flexible, modular digital mixing system that includes the DL32R mixer, DC16Control Surface, and DL Dante™ Expansion Card. "I am looking forward to the DC16," he confirms. "We like the Mackie Master Fader™ app's wireless control, and the control surface will expand our capabilities and address some issues."